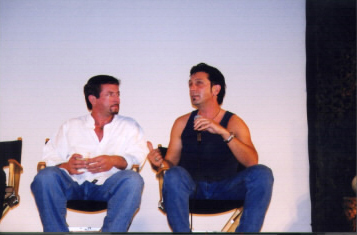 Seated with Clive Barker is spfx genius PATRICK TATOPOULOS, who did the spooky effects for "Saint/Sinner". 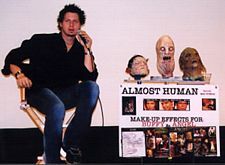 Patrick shot to fame for his incredible work on Dean Devlin's "Independance Day" and "Godzilla", and in the Vin Diesel-starrer "Pitch Black". It's Cousin Brucie! 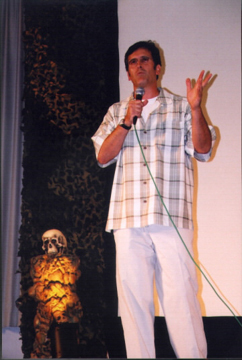 The one and only BRUCE CAMPBELL has a legion of fans around the world for the great work he has done on series ranging from "Brisco County" to "Xena", and on films like the classic "Evil Dead" trilogy, Darkman, Spiderman and many more. Bruce is a great guy and he signed for hours, returning the second day to sign his new book for fans. 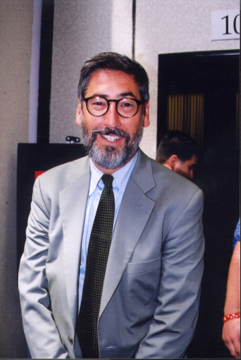 JON LANDIS is one of the many famous Hollywood celebrities who come to the show to take in all the fun and excitement. 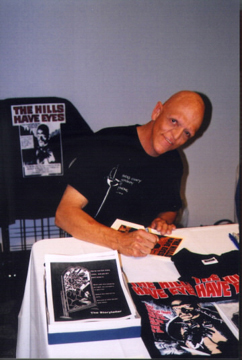 MICHAEL BERRYMAN was on hand to support the promotion of the "Masters of Horror" documentary. We've loved him in "The Hills Have Eyes" and "Star Trek 4". It takes all types to make a town like Hollywood, and that includes the charming (but peculiar) COUNT SMOKULA, who plays a mean accordian and has been a talk show host. 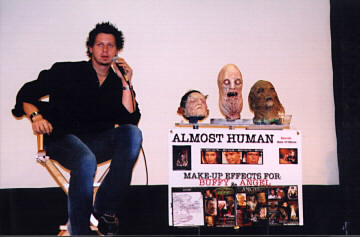 "Buffy" and "Angel" fans were treated to a display of work by ROBERT HALL, who has crafted many of the demons and monsters seen on those shows. 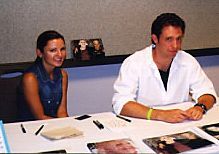 Robert graciously answered fan questions on stage. 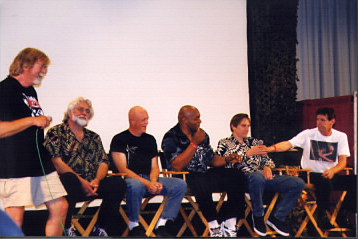 Our "Masters of Horror" presentation included host CHAS BALUN, actors GUNNER HANSON ("Texas Chainsaw Massacre"), MICHAEL BERRYMAN ("The Hills Have Eyes"), KEN FOREE ("Dawn of the Dead"), BILL MOSELEY (HOUSE OF 1000 CORPSES, TEXAS CHAINSAW 2 ) and EDWIN NEAL (The Texas Chain Saw Massacre, Zombiegeddon V). 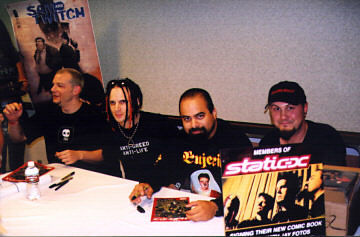 Band members of STATIC-X appeared to support the release of their new comic book from Jay Fotos Studio. 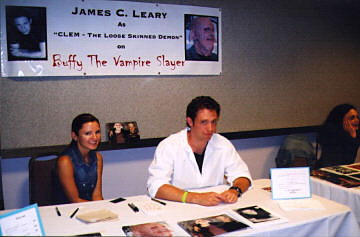 JAMES C. LEARY was on hand to sign autographs for fans of his "Buffy" character Clem The Loose Skinned Demon.